Wayne Cypriano hooked his massive ulua at Kapoho on a 12' 6" IRW Slider pole mated to a Penn 4/0 reel loaded with 80-lb test Trilene. What followed was an epic battle between the "King of the Reef" and one very determined, hard-core shorecaster. 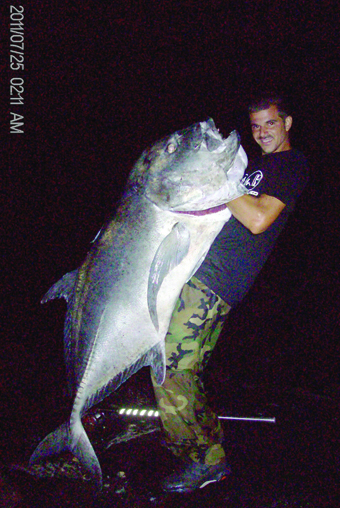 The Hilo Casting Club's certified scales confirmed everyone's belief that Wayne's fish was truly a 100-plus-lb ulua.